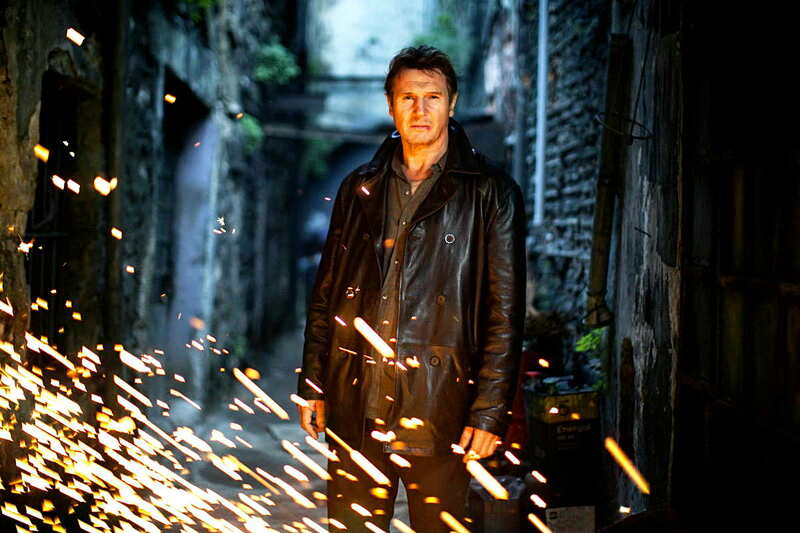 After the events of the first Taken movie, Bryan Mills (Liam Neeson) is performing a security mission in Istanbul. He is surprised to be met by his daughter Kim (Maggie Grace) and his ex-wife Lenore (Famke Janssen) at the hotel, who has recently separated from her own partner. They've come to visit him, although he is still extremely cautious and protective of his family. Bryan is also unaware that the bad guys from the first movie are seeking revenge for the death of their brothers and sons at his very hands. He had to free his daughter from a human trafficking organisation by killing these men. Now they are prepared to ambush him in Istanbul by interrogating someone that knows him. While Bryan and Lenore leave Kim at the hotel, they are stalked by the evil Albanians and eventually captured. Bryan must communicate with his daughter over the phone to try and determine his own location, escape and then finish the baddies once and for all. 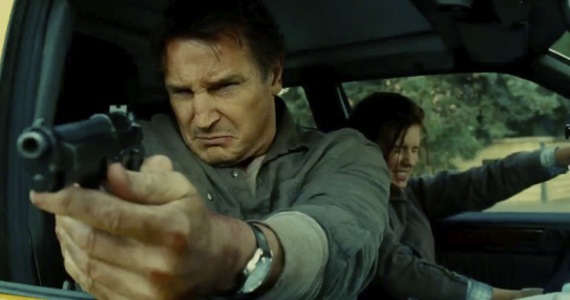 If Taken 2 is not one of the worst films of the year because of its primitiveness and xenophobia, then it is because it is an over-produced bit of tosh, somehow more mindless and insignificant than its predecessor. There is nothing at stake in this film, no afterthought and no one to care about. It is so numbingly ingrained in a formula and signposted at every angle that at the end of its meager ninety minutes, it feels like nothing more than incidental. The film's production notes are hilarious. They praise the original as "one the most successful and relatable action thrillers of recent years" and that audiences identified with Bryan's desire to protect his family. It's easy to forget how many parents are secretly ex-CIA, paranoid killing machines. 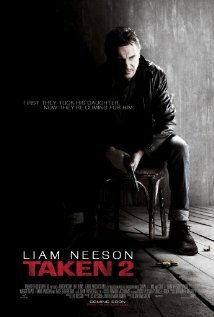 Neither of the Taken films are particularly concerned about family or paternity. That wouldn't be manly enough for this series. It is simply a continuation of Hollywood's unimaginative and archaic revival of the types of action films that were made in the 1980s under the Age of Reagan. Violent actions films of that bygone era were bred from the political view that one person, separate from government or law enforcement, could save the world. The likes of Stallone, Schwarzenegger and Eastwood were king. But part of why Eastwood and Schwarzenegger have survived this long, post-Reaganism, is through self-reflection. Schwarzenegger's acting was never his strong suit, but comic timing was, eventually learning to parody himself. The genre became so laughably over the top that the violence was, to many people, funny. And as Eastwood's politics have moved from right-wing to less conservative views, his films have appropriated this change. His anti-Western Unforgiven (1992) saw him hang up his six-shooter, reflecting on how violence shapes a person, while Gran Tornio (2008) showed that manhood is bred from sacrifice, hard work and self-respect, not body counts. However, despite the magnitude of various political changes and events, Hollywood in its ongoing creative rut is still intent on reviving the action genre, recycling and repackaging storylines and old stars, often without humour or blood. The Taken series, highly derivative of Schwarzenegger's Commando (1985), epitomises this lethargy and strive towards decadence by offering nothing but senseless killing, if only to appease video game fans, with countless goons being barrelled over like bowling pins, bookended by cringing American hokum. It matters not that Olivier Megaton has replaced French director Pierre Morel for this sequel. The template of the first film is lazily copied, retaining its uncomfortable fascist undertones. But if Liam Neeson's Bryan was originally played with conviction, the character now seems possessive and frankly, creepy. Never mind that Kim travelled overseas and survived the wrath of human traffickers (she barely shows any aftershocks from the events of the first film). Bryan discovers an even bigger revelation about his daughter: she has a boyfriend! This leads to some pointless and downright awkward scenes where he reveals that he placed a GPS tracking device in her phone to locate her at her new bloke's house. This is followed by Lenore's insistence that he doesn't run a background check on the poor guy. I didn't know whether to laugh or be horrified. The film doesn't improve once the baddies arrive and the gunfights begin in Istanbul. The film might sidestep condemning Islam and Muslims specifically, but that doesn't stop its grating xenophobic attitude of making all the baddies fat, balding, scruffy, barbarians, whose sole purpose is to torment those poor Americans. Damn foreigners! This untimely attitude, uncomfortable considering recent film-related violence against the West, is compounded by a lack of context. The first film saw Bryan's daughter as a smaller component of a larger scheme. Now the narrative and the locations are repetitive and contained. It drastically limits the scope of the story and the action. Everything that happens is either absurdly predetermined or a blur. How lucky is Bryan that his captors only take him so far that he can still determine his location from the sound of a grenade? It's a good thing he packed those maps and hidden microphone so his daughter can determine where he is. Also, beware any bearded men hiding behind newspapers. If you're watching the film expecting a bloodbath you'll be disappointed too. All of the action scenes are distractingly over-edited, amateurishly photographed and near bloodless. But no matter, at the end of the day the most the Mills family has to worry about is driving lessons and the number of milkshakes they've ordered at the local diner.